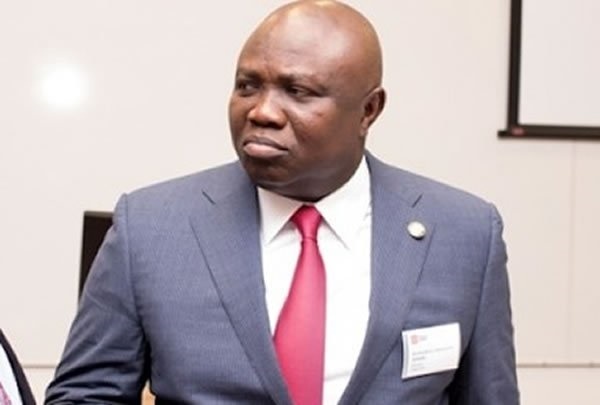 Chairmen of 20 Local Government Areas (LGAs) and 37 Local Council Development Areas (LCDAs) in Lagos State have backed down from their plan to square up with Governor Akinwunmi Ambode over the list of Secretaries to Local Governments and Supervisors. This follows the intervention of the National leader of the All Progressives Congress (APC), Bola Tinubu, who has told the aggrieved Chairmen to resign if they are not comfortable with the list. Some of the Chairmen had moved against the directive of Governor Ambode that the list prepared by the leadership of the party be respected. In some councils like Agege, Kosofe, Alimosho, Isolo ,Orile-Agege and Agboyi Ketu, leaders of the party rejected the list sent by the governor and wrote their own nominees. Ambode was said to have vowed to deal ruthlessly with such Chairmen and party leaders. The aggrieved Chairmen and party leaders in response to Ambode’s threat were said to have reported the governor to Tinubu after he came back from his foreign trip. Tinubu was not in the country when the list was released. The former governor was in UK to visit the wife and children of his first son , Jide, who died on November 1. 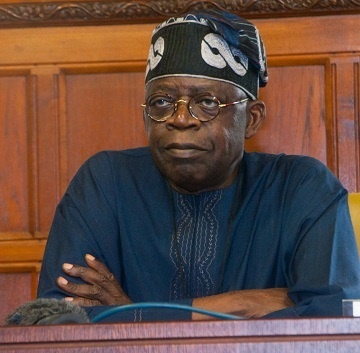 Bounce News gathered that the leaders complained to Tinubu that they were sidelined when the names were being compiled. Some of the leaders claimed complete ignorance of the persons appointed from their respective local governments. Tinubu in his response to the complaints of the leaders was said to have told them that he would not allow anybody rubbish Ambode. He exonerated the governor from blame over the whole crisis, saying the governor was not in any way connected with the list sent to the 57 councils. He was said to have told the leaders and Chairmen that even if it was Ambode that single–handedly drew up the list, he shouldn’t be questioned by any member of party, because of his office and as leader of the party in the state. Tinubu insisted that the list is final and no local government should refuse to comply. He told the party leaders that any Chairman who cannot work with the appointees should resign without further delay. Surprised with Tinubu’s response, the aggrieved Chairmen and party leaders were said to have reluctantly agreed. In an emergency meeting shortly after Tinubu’s intervention, the Chairmen under aegis of Conference 57, pledged allegiance to Governor Ambode. In a statement signed after the meeting by the Public Relations Officer of the group, Olusesan Daini, the group directed its members to expressly comply without further delay. “We expresses our total and unquestionable loyalty to our party, the All Progressive Congress, especially to our national leader Bola Ahmed Tinubu and absolute commitment to our amiable and dedicated Governor, Akinwunmi Ambode whose performance is yet to be compared to what is obtainable in other states. “We wish to reiterate again that in 2019, there is no vacancy in the State House and hereby express our strong desire to work tirelessly for the return of our performing Governor in 2019 for second term to enable him complete and consolidate the good works he has been doing across the state. “On the threshold of the above, we the Chairmen in 57 Local Governments and LCDAs hereby come out to maintain our stand, and as such declare that the party list comprising the appointments of the Secretaries to the Local Governments and Supervisors is sacrosanct and that the party decision is supreme. Despite the intervention of the group, the crisis is far from being over in some local governments. In Isolo LCDA, some leaders are still battling with the Chairman, Shamusdeen Olaleye over the list. The leaders have accused the Chairman of not following the list. Olaleye has, however, denied the allegation. 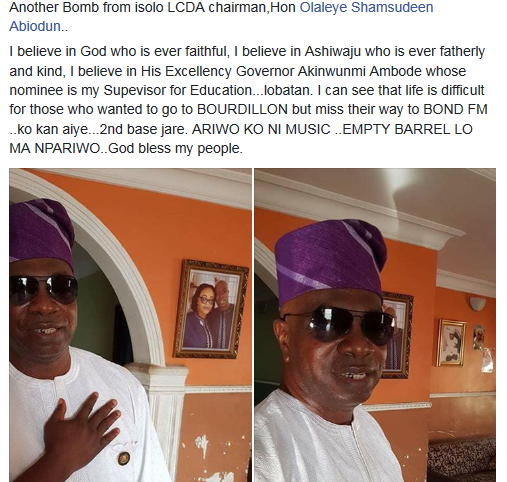 He told Bounce News that there was no dispute over the list in Isolo and that those crying foul were only out to discredit him and the party leaders in the LCDA. Efforts to reach the state chairman of the party, Henry Ajomale, proved abortive.